At 11 pm, we have moderate snow falling. We've seen snow since 6:00 this evening. Right now, a Snow Advisory is in effect until 12 Noon on Wednesday. This is, easily, our biggest snow event of the 2007-2008 Winter Season. I've got 2+ inches on the ground, more in protected areas (like our patio furniture). Schools are closed for Wednesday. Limited posting due to the flu bug...struggling with chills, body aches, fever, cough, sneezing and a sore throat...will catch up in a few days. Cold, Ice, Rain, and MORE! It is going to be a crazy next few days in the Upper Cumberland section of Middle Tennessee. Timing, as usual, is everything with the next system. If it's late, then we'll have all rain. I do believe that whatever falls will eventually turn to all rain. It is an interesting time to be an observer of the weather! While we've yet to see anything (at 6:30 am), snow has been falling in sections of Middle TN to the west of us. This snow event should wrap up by 10:00 am at the latest. We will see the active weather pattern continue this week. Watching a couple of systems that'll bring wintry weather for both Wednesday and Thursday. Good Monday morning to everyone. It is President's Day...designed to honor the births of Washington and Lincoln! I believe that to the windy conditions (yet to confirm this), we are having intermittent power outages here in the Cookeville area....power was down about 35 minutes at my home. I'll continue to watch any developing situation and post as needed. After a quiet Saturday, our weather will get cranked up once again. We'll see a slight chance for showers tonight, a big chance for thunderstorms on Sunday, with rain changing to snow on Sunday night. President's Day promises rain and snow with all snow by Monday night and just plain cold on Tuesday. Something for everyone! Interesting post over at the News 2 Weather Blog about why the tornadoes missed the city of Nashville. President's Day will find most, if not all, schools closed this coming Monday. We're watching a possible developing snow system for Monday as well. Before then, we'll see quite a bit of active weather. Temperatures will push 60° by Sunday but with increased chances for storms and strong winds. I chose this title to my blog post today because if you look at yesterday's post, I said the precipitation would likely move out before the cold air got here. Typically, in Tennessee, that is the case. Well, this morning, I awoke to not only snow on the ground, but also to a whole host of school closings. At least the kids will be happy about that! In very plain and simple terms, I missed it yesterday! And that's ok! Today will be COLD...highs struggling to reach 30° here on the Cumberland Plateau. You can see the local forecast for us by clicking on the links to the right of this post. There are other links that will lead you to some interesting talk about today's weather. Looks like we'll see alot of wind and some rain...upwards of an inch for some locations for our Tuesday..behind the rain is COLD air again. We see Wednesday morning temperatures in the 20's again...don't think the precipitation will be here when the cold air arrives, thus giving us virtually no shot at any frozen precipitation this time. Monday morning temperatures across Tennessee are cold. Several stations are reporting 16° at 6 a.m. Our forecast is for a cool day with highs just in the middle 40's...rain moves in tonight and on Tuesday and could possibly end as snow on Tuesday night. We have a complete report from Macon County concerning the devastation. I will post that later today along with a quite interesting story. More on that later. Today, my family & I head into tornado-devastated Macon County, TN. My wife's grandmother and uncle live there and they need help. 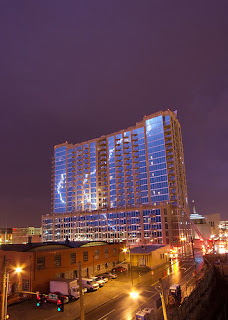 Check out this incredible picture from Chris Wage that I found on NashvilleWX.com....the post is located here. Congrats Chris...his work can be found here. As if the residents of this fine community didn't have enough to deal with, a Pastor and his family were killed yesterday in an accident near where the tornado struck. Reverend Michael Welch, who had setup a family crisis center after the tornado struck, along with his wife and two kids are dead. He was working with five different families who had lost loved ones in Tueday's tornado. Their vehicle was rear-ended by a tractor-trailer. "He told me he had to minister to five families who found out they had lost loved ones," said the Rev. Don Jones, pastor of the First Baptist Church that is about a block away from the Methodist Church. "They had opened the church up to any survivors, any family members." Our latest, local weather forecast here. How do SuperCells & Tornadoes form? On February 8, 1960...Nashville receives 7.4" of snow. A strong line of super-cell thunderstorms struck Memphis from Arkansas between 6:00 and 6:15 pm on February 5, 2008 and swept northeast through the state. These cells developed tornadoes in several locations causing severe damage to multiple locations in eleven counties from Shelby to Macon. The storms finally departed Tennessee shortly after midnight. There are 33 persons reported as fatalities by the Tennessee Department of Health and over 189 injured; one person is missing. CLAY COUNTY• One injury (tornado). FAYETTE COUNTY• One fatality in Somerville (Fayette County): truck overturned in tornado.• Up to 25 tractor trailer trucks overturned (revised) on I-40 between Mile Markers 60 and 70 between Memphis and Brownsville. MADISON COUNTY• Two fatalities in Denmark (tornado), 64 injured.• Union University had 16 students trapped in a dormitory, 3 critical injuries.• Jackson Oaks Retirement Center initially reported 50 persons trapped, but American Red Cross arrived and moved the residents to a shelter. SHELBY COUNTY• Three fatalities and 36 injured (tornado caused wall of building to collapse).• THP radio tower with THP and TEMA antennas fell in Arlington.• Wall collapse due to tornado on Sears Building in Hickory Ridge Mall, Memphis, 1 death.• 120,000 pounds of Anhydrous Ammonia released into the atmosphere at Hardy Bottling Company, 5151 East Rains, Memphis (no impact on public).• Memphis Airport closed Runway 27 and Taxiways 2A and 2B; Gate B39 damaged. TROUSDALE COUNTY• Pipeline fire (now burned out), Columbia Gulf Transmission Company, 5422 Green Grove Road, Hartsville, TN• 3 fatalities (tornado), 2 injuries, 1 missing. WILLIAMSON COUNTY• 4 injuries (tornado)SHELTERS: 2 open with 85 occupants (peak was 140). ....about the weather today other than it'll be more settled...for many of us, that is a GREAT thing. Cleanup work goes on across much of West and Middle Tennessee after the storms of Tuesday night and Wednesday morning. On February 7, 1979...Cheatham Lock & Dam records its greatest one-day snowfall ever, with 8½", as well as Lafayette, with 6.2". The fire is apparently a natural gas line from a company called Columbia Gulf. Just got a report in from Livingston, TN that they can see the glow....they are 90 miles away...amazing. Trousdale County Executive Jerry Clift reporting Columbia Gulf is the name of the gas company line.....confirming it is the pumping station....on Hwy 141 near the Macon/Trousdale county line....Mr. Clift is approximately seven miles away. BIG FIRE is supposedly a natural gas line.....between Hartsville and Westmoreland...Hwy 141 near Columbia Gulf.....still working on exactly what it is. Union University in Jackson, TN is heavily damaged. A girls dorm was hit and some students were trapped. A HUGE FIRE is burning out of control and is visible by residents in at least 5 counties in northern Middle Tennessee...thinking the location is between Westmoreland and Lafayette.. Not sure at this point what it is...waiting on more reports. Alot of tornado damage along Hwy 45 bypass in Jackson, TN. .....is approaching our area and could produce severe weather overnight tonight (especially as we head toward daybreak). The one silver lining in all of this is the temperatures. We'll see highs today SCARE the 70° mark. Our record high here in Cookeville for February 5th is 70° from 1962. Please stay tuned to local radio/TV, NOAA Weather Radio, or on the internet, you can go to several sites for information. I'll list them below. On February 5, 1996...Temperature at Sparta drops to -20, setting an all-time record low. Crossville's low of -16 sets a record low for February. We saw -13 here in Cookeville. If you live in Tennessee or any of the other 'Super Tuesday' states, go and vote. 2008 has gotten off to a rousing start! 111...comments you readers made about my posts! We'll have a cloudy day with a slight chance for rain today. More rain moves in tonight! Hey, it's the BIG GAME day! New England versus New York. I'd like to see the Patriots complete their perfect season. Heard Phil the Groundhog saw his shadow. Legend has it we'll have six more weeks of winter. I don't believe the little varmit! Today at 2 p.m. will be the funeral for my 91 year-old grandfather. When he passed away early Tuesday morning, I felt led to offer my assistance to my mother and her sister to lead (or officiate) his funeral. They accepted my offer and I've about completed an honoring tribute to his life. As I've reflected back of the years of my grandfather's life, it is amazing how much this man accomplished. It is amazing the legacy he left. Proverbs 13:22 says "A good man leaves an inheritance to his children's children" and he left an incredible inheritance in the way he lived his life. I intend to follow his examples and leave behind a legacy that will inspire my family, too. Snow flurries flying in Cookeville. A strong front will race through this morning bringing in colder air and snow chances. I don't expect any accumulation at this point. Interesting that just to the west of Nashville, Winter Weather Advisiories and a Winter Storm Warning (in Western KY) has been issued. This weekend will be nice on Saturday as we break 50° under a sunny sky, then the rain returns for the first half of next week. Temperatures appear to be moderating. Precipitation continues at Nashville through the morning, most of it as snow, and finally ends around noon. An additional 5.2" are measured, leaving the city buried under 8" of ice and snow. Nashville receives 6.7" of snow. I accept a position with Lamar Outdoor Advertising and celebrate my six-year anniversary today!